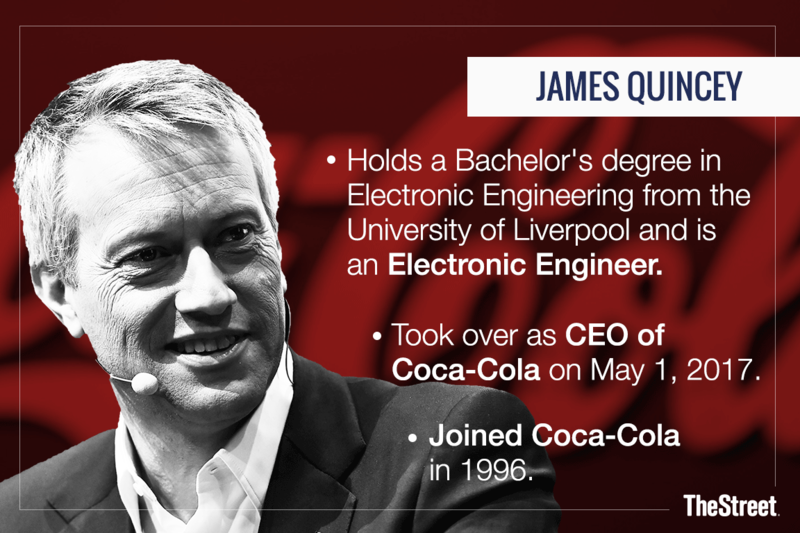 Coca-Cola CEO James Quincey is hard at working trying to take the storied beverage giant to the next level. TheStreet talks with him about fourth-quarter results and the year ahead. Coca-Cola Co. (KO - Get Report) loaded up on the caffeine in its fourth quarter and in its outlook for 2018. The beverage giant's fourth-quarter earnings beat Wall Street's profit forecasts by 1 cent on Friday, Feb. 16, fueled by momentum in the water and tea categories. Profit also was boosted by Coca-Cola's cost-cutting efforts. Organic sales increased 6% from the prior year. For 2018, Coke said it sees organic revenue rising 4%, with earnings gaining as much as 10%. All eyes now turn to whether Coke CEO James Quincey, who took over in May 2017, will use acquisitions to take profit growth to the next level. Coca-Cola is watching the deal activity sweeping the beverage industry, just don't expect it to make a big splash just yet. "You could look at what we have been doing over the last few years, we have certainly been favoring bolt on acquisitions that allow us to find new, innovative ideas and brands and then expand them to more countries or provide them capital to grow more quickly," Coca-Cola president & CEO James Quincey explained to TheStreet when asked about recent industry activity. "In the end, deals have to make strategic sense, financial sense and it takes two to tango -- our track record is to use bolt on acquisitions to help add onto our platform," Quincey added. Deal speculation has ratcheted up since Dr Pepper Snapple Group Inc. (DPS and Keurig Green Mountain Inc. said in late January it would merge into one company to be billed as Keurig Dr Pepper. The newly formed Keurig Dr Pepper will bring together Mott's, Sunkist and 7UP with coffee brand Green Mountain and the more than 75 owned, licensed and partner brands in Keurig's portfolio. While Quincey played it low key on Coke's thoughts on the new beverage combo, PepsiCo's (PEP - Get Report) CEO Indra Nooyi questioned the transaction. "We've been reading all the reports that you guys have written to understand the real strategy behind that merger, I'm sure there's some towering strategic logic, but we are still searching for it," Nooyi told analysts on a conference call this week. PepsiCo is a holding in Jim Cramer's Action Alerts PLUS Charitable Trust Portfolio. Want to be alerted before Jim Cramer buys or sells these stocks? Learn more now.